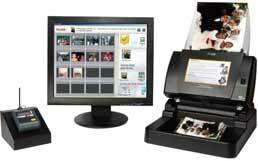 The KODAK Picture Saver Scanning System PS450, is a walk-up model (self-serve photo conversion) with included credit/debit card payment device. The PS450 scans up to 30 pictures per minute at a resolution of 300 dpi. Once scanned, the included KODAK Picture Saver Scanning Software enables users to seamlessly burn images to a variety of media, including: CD, DVD, KODAK Picture CD, Portable USB drives. Image retouching that allows you to digitally adjust brightness, contrast and color balance to restore older pictures. Physical dimensions 14.8 x 13 x 12.7 "